Now you can do math without holding a pencil. We've integrated the principle of Universal Design into an elegant interface that allows people to work independently on "digital paper". Math Paper offers the foundations to learn simple arithmetic, and the power to do complicated equations. Do whatever problems you want. Or choose from hundreds that come with the app. For people with motoric challenges, we've just solved the toughest math problem of all. This is body copy. It tells you everything you are going to find out about this. But not too much. After all, we sure don’t want this to get too long to read! Okay, that’s it. Go read the next one now. WE'VE MADE MATH ACCESSIBLE. HERE'S HOW! Math Paper lets you do math as easy as 1+1 = 2. 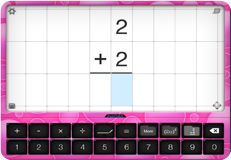 But it also has amazingly intuitive tools to let you do carry functions (for any operation), create fractions, and do long division. If you have motoric challenges, Math Paper even lets you move your cursor from the bottom of the iPad. In other words, the challenge to do math is < it was before! Math Paper has what you need to do high level algebra. And whether you zoom a finger around a page, or want the supports of our baseline access, our grid system allows amazing organization. The Advanced Math folder has all you need to achieve your learning goals. 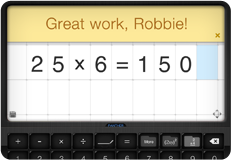 From variables to exponents, you can reach the nth power! Math Paper isn't like other apps. It doesn't simply give you problems. It gives you a way to approach the problems you want to do. Like those in textbooks. 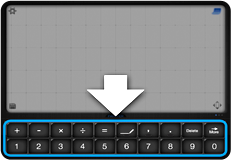 And our interface has thought through so much, even an intuitive and efficient way to handle fractions - with a special interface that's intuitive and accessible. Get to the root of the problem. 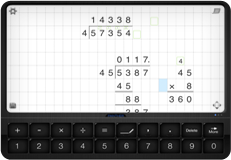 Math Paper houses a diversity of function and symbol keys that allow you to diagram even the most advanced calculations. Our "Sum" button underlines the problem you're working on and similarly, our "Sqare Root" button encircles radicals. Keep track of it all. An easy-to-maneuver file management system equips Math Paper with the capability to file away each piece of paper or quickly convert your work to a PDF and send it out as an email. 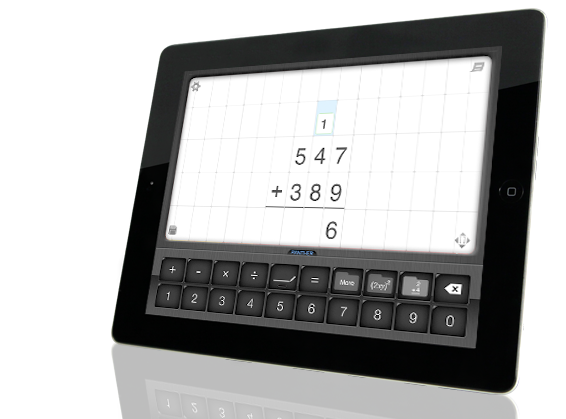 Math Paper was designed especially to help individuals with motoric disabilities do math. That means you'll find all sorts of many innovative supports. From hold times that help you avoid accidental hits, to folders that put alternative navigation controls at the screen's bottom. You'll appreciate the thought that's gone into this gorgeous interface. Panther Math Paper can be used on its own. Or use it along with other Panther Apps to support the broadest access possible. Check out the following for some great ideas.